Texture kCraft for Minecraft PE 0.9.5 - this gorgeous new textures for Minecraft Pocket Edition. You have accumulated a large amount of unnecessary blocks that litter boxes? With this mod of them can now get rid of the benefit. Purpose mod is to as quickly as possible to increase the complexity of the chances of survival. This mod adds a set of armor Azure, which gives you the ability to jump to a height, it also adds a sword that does 7 damage. This mod adds to the game Minecraft Pocket Edition new items, bosses and blocks! 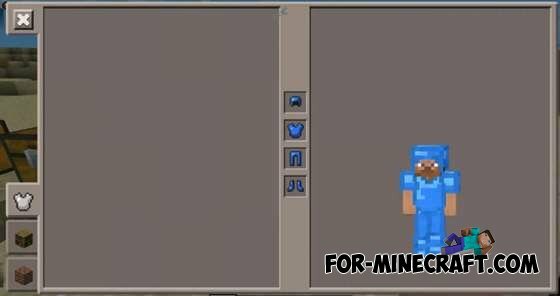 Heal Botton script for Minecraft PE 0.9.5 - this healing mod for Minecraft PE 0.9.5. Mod you add an extra button in the game, with which you can restore your health. Comands and Bur Mod for Minecraft PE 0.9.5 - this mod to drill and commands for Minecraft PE. It's two in the same mod. In the archive you will see two files with the modes and special texture.